Sterling Systems & Controls, Inc. has over 45 years of experience and a unique industrial application knowledge base. Our reputation is earned. We are a premier provider of efficient solutions for automated batching systems, weighing, bulk bag filling, bulk bag unloading, process controls, and plant automation. Just need to focus on improving a portion of your process, or need full production automation? Whether materials receiving, internal flow, up/downstream equipment control, batching, weighing, loadout or entire plant automation systems, we are a premier provider and can customize a solution for you to be what you want and need. 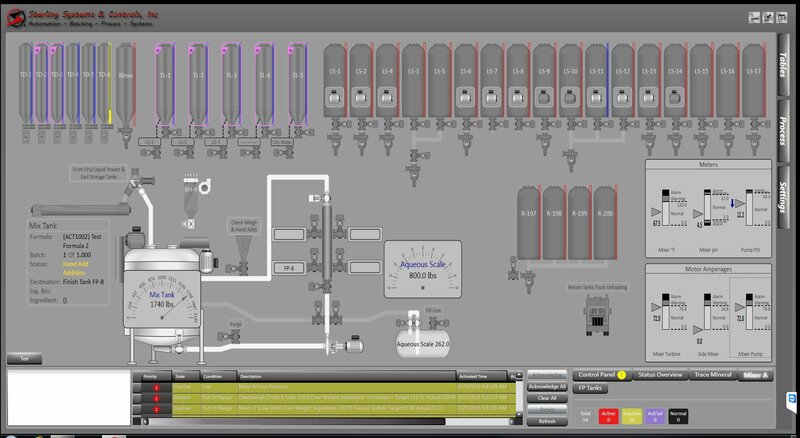 Sterling Systems & Controls provides process equipment hardware and automation software using PC’s or PLC’s, HMI/PC and electrical control panels, MCC’s and onsite service. We can deliver you a turnkey solution, or just provide you with one or more of the pieces. Sterling Systems & Controls, Inc. is also a UL listed certified control panel builder for the USA and Canadian markets. Sterling Systems and Controls, Inc. will create custom designed, engineered and manufactured systems based on your exact needs. No two system solutions are exactly the same. Today, our custom state-of-the-art designs utilize the latest technology specializing in weighing and batching systems, data management, as well as raw material and production data tracking. We offer our capabilities and services for OEM and end users alike. Sterling Systems’ software, electrical and mechanical engineers design complete processing systems for various automation requirements within a wide array of industries. These systems include automated weighing/batching systems, complete plant automation, modular weighing systems, and upstream/downstream equipment including raw material handling systems, bulk bag filling stations, bulk bag unloading systems, conveyors, and post batch material handling systems. In addition to process equipment, we provide process controls, motor control centers, control panel fabrication and general automation utilizing many standard hardware and software platforms. Our forte is custom batching systems, material weighing systems, and plantwide automation systems. Sterling Systems provides the best single-source solutions due to our eye for details and a well-rounded history in working with the Feed, PetFood, Agriculture, Food, Baking, Chemical, Rubber, Plastics, and other industries. We also can integrate the automated process control system with your general business system. And if you need remote monitoring of your control system data, we can provide this capability with our WebCentral software application. WebCentral is a browser based application that allows you to access the database of the automated control system. You can review and print historical reports and change system parameters from a remote PC, so long as the PC resides on the same network as Sterling Systems automation control system. Because WebCentral is browser based, it is very simple and intuitive to use. It is ideal for applications where a variety of individuals need to access information from the control system in a secure, reliable and simple manner. We are proud to be a part of a family of companies that serve the dry material processing and handling industries. This includes our two sister companies, Industrial Magnetics, Inc. and Prater Industries, Inc.. See these other companies below to find out more. Prater offers a wide range of equipment for particle size reduction, enlargement, feeding and separation such as mills, grinders, lump breakers, classifiers, rotary airlock valves, and more.